Unless you buy chicken freshly killed on the farm or one that's certified organic, it's likely that you'll get poultry that contains added sodium and other chemicals. 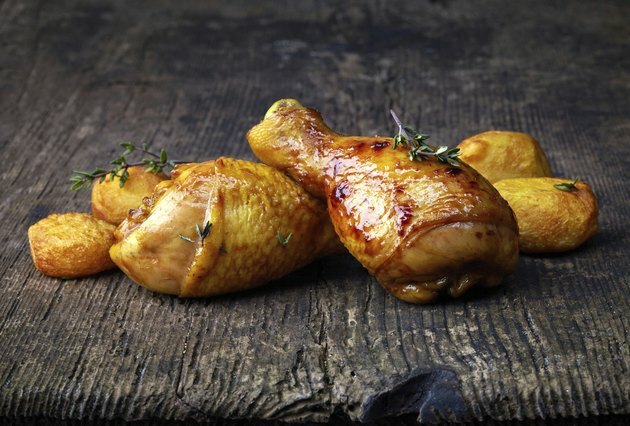 Adding salt or sodium to chicken helps preserve it, adds moisture and helps remove the blood from the flesh. Brining chicken is the main way of getting excess salt into the flesh; however, you can also add too much salt during cooking. You can remove excess salt from chicken before or during cooking and still leave the meat tasting good. Soaking chicken in a solution of water and salt is called brining. This process adds moisture and flavor to meat that cooks for long periods by preserving the flesh and tenderizing it. Brining helps remove the blood from the flesh and is always used to treat Kosher chicken. Brined chicken can produce an overly salty taste and salty drippings, making poor-quality gravy. Supermarket chicken is not the only poultry that is brined. Some cooks brine their birds to help tenderize them, mixing salt with other spices to add flavor at the same time. Chicken that has been enhanced with brining either by the supplier or in your own kitchen makes a poor choice for those on a low-sodium diet. Eating brined chicken adds additional, unmeasured amounts of sodium to a person's daily intake and can create or aggravate existing health problems. One way to remove salt from raw, brined chicken and other poultry is to soak it in water or buttermilk. Soaking in water helps remove the salt and leaves the chicken intact and ready for cooking. Soaking the chicken in buttermilk leeches the salt from the meat. The acidity of the buttermilk helps tenderize the bird and adds a tangy flavor that helps mask any lingering saltiness. Sometimes you can't remove enough of the salt from a brined chicken by soaking it ahead of time; or you may have added too much salt to chicken soup or stew during cooking. In this instance, add some plain, cut, white potatoes to the cooking pot to absorb excess salt. This only works for soups, stews and chicken dishes made on the top of the stove, and not for chickens being roasted, fried or grilled. When the soup or stew is finished cooking, carefully remove the pieces of potato and discard. Another method for reducing the amount of salt in a thick chicken soup or stew is to remove the crusts on several pieces of bread. Break the bread slices into crouton-sized chunks and place the broken pieces of bread on the top of the mixture. They will absorb the liquid and simultaneously absorb some of the extra salt. When the bread is saturated, remove the pieces and taste the soup for saltiness. Add more bread until the correct level of saltiness is reached. The Science of Cooling: What Gives Meat Its Flavor?